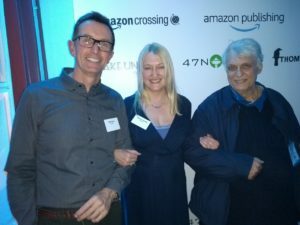 For the last few years, my husband and I have been attending the London Book Fair at Olympia, and what a fabulously exciting event it is! Much more author-friendly than a few years ago when it used to be a trade fair just for publishers and agents, there is now an Author HQ with talks all day and plenty of opportunities for writers to meet up and exchange news. Here I am at the KDP stand with indie bestseller and all-round lovely person, L J Ross. 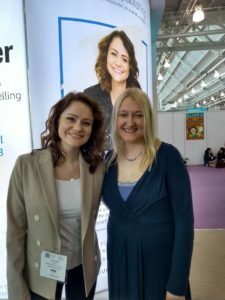 I was thrilled to meet up with my new Czech publisher who has just published A Weekend with Mr Darcy and is going to translate Dreaming of Mr Darcy next. And it was wonderful to meet some fellow Lake Union authors too. 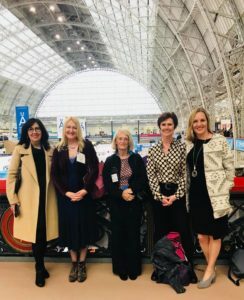 Here I am with Julianne MacLean, Freda Lightfoot, Imogen Clark and Jo Furniss. 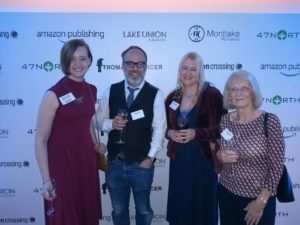 and chatted about the joys of being a hybrid author with Mark Dawson and Freda. Now it’s back to the desk. I’m currently planning a brand new series of books set on the Sussex Downs and I can’t tell you how excited I am. I’ve been thinking about these books for years and I’m thrilled to be making a start on them.